So it's Christmas day. The talk of the table has turned to current affairs and honestly you've had enough of Grandad's UKIP views. It's time for a distraction. 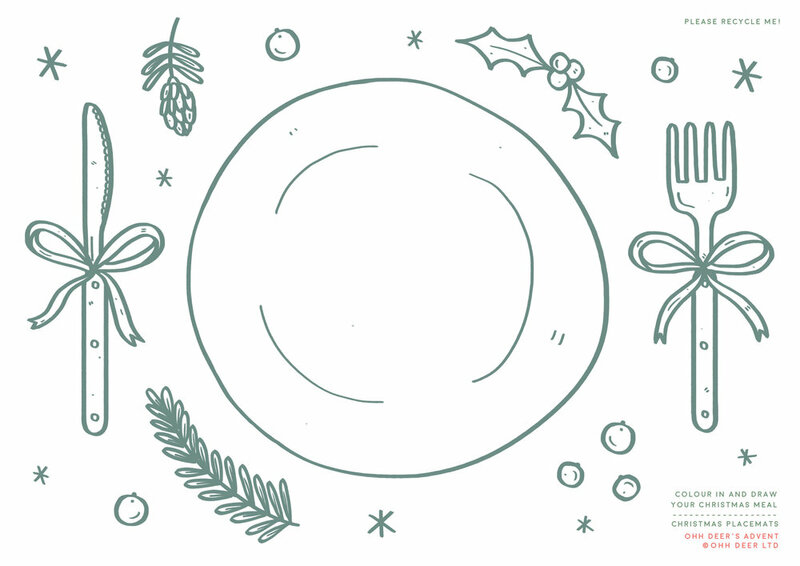 Print out, colour in and get creative with a selection of three festive placemats! Suitable for all ages, and hey, perfect for keeping the kids content! Share your creations on Instagram using #ohhdeeradvent, Merry Christmas everyone! Draw the most extravagant festive feast! Grab your colouring pencils and make it the best ever. More of the sit back and observe the chaos kind? This one is for you. Note down your tastings and give your verdict (warning: mum may get offended). Even play a small game of bingo featuring a selection of christmas day classics. If only this forest was real. Complete with happy Christmas trees and tiny robins, its a winter wonderland! Crack out the colouring pencils and make it shine, there are even a few un-decorated trees for you to dress up!